That's how Arnold Berman describes everyone he and his wife Sylvia came in contact with while Sylvia was being cared for by Hospice of Saddleback Valley, a department of Saddleback Memorial Medical Center. Hospice of Saddleback Valley provides services that improve the quality of life for those facing death, loss and grief by promoting hope, compassion and comfort. "They treated her wonderfully, and they kept my morale up," says the Laguna Woods resident. "Anything we needed was available 24/7 if necessary. Every single person we came in contact with, from the nurses to the aids to the switchboard operator, were terrific. They have a very positive approach-they do everything from the heart. You can feel it. They are magnificent people, like angels." 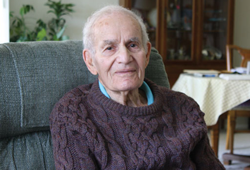 Saddleback Memorial Foundation considers Mr. Berman an angel, because he has provided the Foundation with a generous charitable gift annuity with the funds designated to benefit hospice services. His initial donation was partially tax-deductible and now Mr. Berman receives a fixed amount of income from the Foundation every year for the rest of his life. "Both of us wanted to do it," explains Mr. Berman. "We talked about it before she passed away. Sylvia wanted to show her appreciation for the care she received, so I said I would make a donation. Now, the appreciation I've received has been overwhelming."